Roasted broccoli is my junk food of choice. I can down an entire sheet pan in one sitting. No joke. Wait, what? You don’t consider broccoli a junk food? Well, come to think of it…you’re right! But, roasted broccoli tastes so good! It is crispy on the edges and salty and roasted (we all know everything is better roasted). It is the perfect substitute for a chip. And it’s still healthy for you! Woot woot! Okay, yes, this takes a little more forethought than pulling out that bag of tortilla chips, but it is completely worth the effort. Before I met Mace a giant plate of roasted broccoli was a perfectly acceptable meal for me. I quickly found out this isn’t necessarily what everyone would consider an actual meal. Shrug. So, I added some quinoa, whipped up a roasted red pepper sauce and…voila! Roasted broccoli with quinoa and roasted red pepper sauce. Roast the broccoli at a high temperature, 450F is best. Don’t crowd your florets on the pan, make sure they have plenty of room or they will steam in the pan and no crispiness will happen. Sad. Other than that, toss it in a little olive oil and salt, add some thickly sliced shallot or onion, and roast away. Roast the broccoli for about 15 minutes, then stir and flip and bake another 7-9 minutes, until the crowns are very dark and crisp. Now, if you were me, you could just pile this all on a plate and eat it for lunch. If you are all the other people, you can carry on to the next steps. What the heck is quinoa and how do I make it? Quinoa is a vegan’s dream come true. Quinoa (pronounced KEEN-wah) is often considered to be a whole grain, but it is actually a seed from a weed-like plant named goosefoot. It has become popular in recent years and is touted as a super food for it’s nutritional benefits. High in protein, quinoa also contains all nine essential amino acids, which is rare in plant-based foods and a huge A+ for vegans and vegetarians. One cup of cooked quinoa provides a whopping 5 grams of fiber, 8 grams of protein and 15% of the daily recommended value of iron. Super food indeed. The other great thing about quinoa is that it cooks in 15 minutes, so it’s a quick addition to any meal. First, you’ll want to rinse your quinoa. Saponin is a coating found on the outside of quinoa and will leave a bitter and soapy taste after cooking. It’s recommended to thoroughly rinse quinoa in a mesh strainer prior to cooking to remove the saponin. You can buy quinoa that is pre-rinsed, so make sure to read the label if you’re not sure. Next, you can lightly toast the quinoa in a dry pan, if desired. Or, you can just skip this step and add 1 cup quinoa and 2 cups liquid to a pan and bring it to a boil. I recommend using vegetable stock or broth for added flavor, but if you’re watching your sodium intake or need a neutral flavored grain you can just use water too. Reduce to a simmer, cover and allow to cook for 12-15 minutes, or until all the liquid has been absorbed. Turn off the heat and allow it to sit another 5 minutes. Fluff with a fork and it’s ready to eat! Cream sauces are such a staple in cooking, that most people are sure they could never live without them if they went vegan. Not to fear, cashews have your back. (Side note: I will be experimenting with sunflower seeds in the near future to give a nut-free option to you guys, but for now we have cashews.) Cashews are a great substitute for heavy cream and can be used in place of cream in most recipes. If you don’t have a high powered blender like a Vitamix, you’ll want to soak your cashews for 8 hours before blending or they may not liquefy properly. I recommend using 1 cup cashew and 1/2 cup water to make a heavy cream substitute. If you need a more pourable sauce you can always thin it out later. The roasted red pepper cream sauce will need to be thinner, and we want to boost the flavor, so we’ll use 3/4 cup cashews and 1/2 cup vegetable broth. Add these, a couple roasted red peppers, lemon juice, garlic and salt in the blender and blend away until you have a thick, creamy sauce. Add a little more vegetable broth as needed to aid in blending or get to your desired consistency. You can either roast the peppers yourself, or go easy peasy and buy them in a jar. Either is perfectly acceptable. This is a meal that is pretty hands-off and comes to together in a snap on a weeknight. You could add some chickpeas to it for some added protein if desired, or just eat it as is. Or really, skip everything else and just eat the broccoli. Its your call. Enjoy! Crisp roasted broccoli on quinoa with a roasted red pepper cashew cream sauce. This is a quick weeknight dish that is packed full of flavor and nutrition. Preheat oven to 450F. Spread broccoli and onion evenly on a rimmed baking sheet lined with parchment paper and drizzle with 2 tablespoons of olive oil and salt and pepper to taste. Toss to combine. Roast for 15 minutes, stir and roast for another 8-10 minutes, or until broccoli is charred and slightly crispy. While the broccoli is roasting start the quinoa. In a medium saucepan add the quinoa and 2 cups vegetable broth. Bring to a boil, then reduce the heat to a simmer, cover and cook for 15 minutes. Turn off the heat and let sit until ready to use. Fluff with a fork right before serving. Roasted Red Pepper Sauce: Add all ingredients to a blender. Blend until completely smooth, about 2-5 minutes, depending on your blender. If you prefer a thinner sauce or there isn’t enough liquid to blend properly, add more broth or water until you’ve reached the desired consistency. Season with salt. 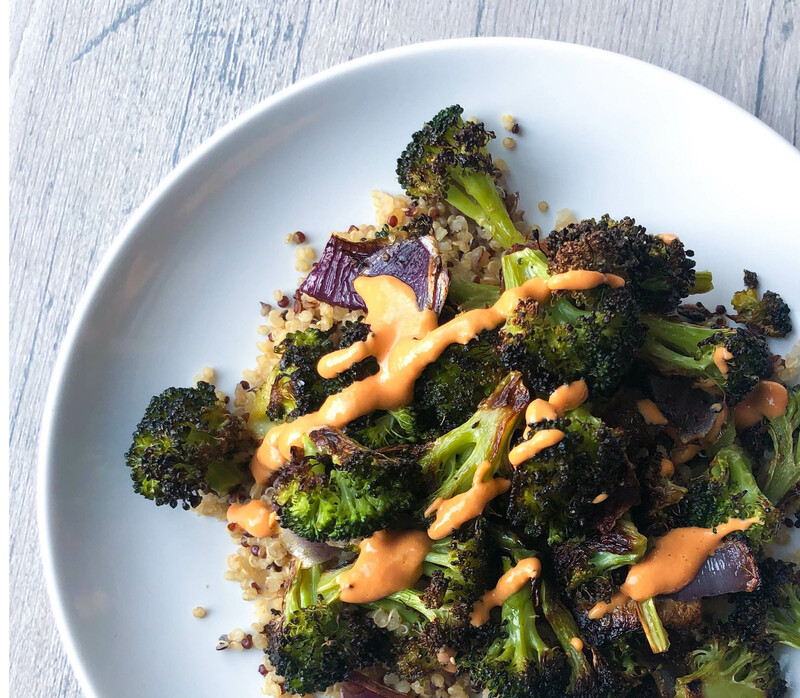 To serve: put quinoa in a bowl, add broccoli mixture on top and drizzle with roasted red pepper sauce. You'll probably end up with more sauce than you actually need for this dish. The extra sauce can be used for so many things such as: salad dressing, sauce on a pasta or a vegetable dip.